The following interview took place at the NTSGA Superjam, October 4, 2004, in Nashville, Tennessee. SGR: What a great show you did tonight! Joe: Thank you, Gib. We had a great time. I had some old friends up there playing with me. SGR: I walked in a little late when your set started. Who was this guy up there? Joe: That guy was Theopholis. He’s my alter-ego. He’s one of the characters I use when I do a show. I’ve been doing him about ten years now. I use to do him at a show in Williamsburg, VA called the Old Dominium Opry. We had a good time doing characters. SGR: Joe, you’re from Michigan. Did you grow-up and start playing steel there? Joe: I started playing steel in October of 1962. I was eight years old when I started playing Hawaiian music in Jackson, Michigan. I basically learn the Owhau method. Learned to play all the Hawaiian songs and sheet music until I was about eleven years old. Then I quit playing for awhile. SGR: I notice you’ve got a little rock influence in your music. Joe: That come from being up in Michigan playing all the honky tonks and clubs. You had to play it. Lot of the gigs I played were wedding receptions or something of that note where you have people wanting to hear country or people wanting to hear pop. If you’re going to dance, you’ve got to play some rock n’ roll. SGR: Joe, you are a very versatile picker. Is that just the Joe Wright style? Joe: I just wanted to work and play music in a band, and you had to play all different styles. I played in show bands where you had to play show tunes. We’d do the William Tell Overture, and the lady would play mandolin, and we’d do Serivan music, just not your normal Nashville steel guitar. I was just part of the group, and I happened to play steel guitar. 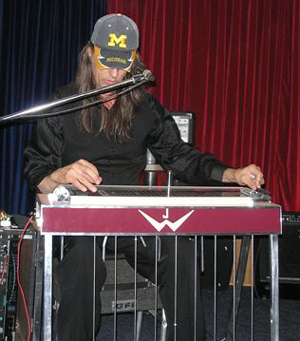 I’m just a musician that plays steel guitar. SGR: That’s the understatement of the year. Joe: I just try to play the song. I sing a little bit too, but my steel guitar is my voice. I try to speak with that. SGR: How did you get started playing steel guitar? Joe: That’s a good question. It was totally different in 1963 when I started. There was not a lot of pedal steel. The hard thing for the kids nowadays is there’s so much other that we can do. DVD’s to rent, videos to rent, computers to play with. So someone starting on steel guitar, let’s say in you area, #1-they have got to have the desire, the obsession. They can’t live without it. Steel guitar - guitar, I don’t care what they want to play, they’ve got to have that. And personally, give them a guitar instead of a gun. SGR: That is said so well. Joe: It is way pass dedication. I call it an obsession to where you have to do it. That’s what makes the players good. You take Buddy Emmons, Lloyd Green, Hal Rugg, John Hughey, the list goes on. Anyone in the top eshilon, it was just not something they did, it was something they had to do. They are always drawn back to learning more and wanting to learn more and be better. Our instrument is so new, we started in 57’ or what it was to they played it on a record first, using the pedals and bending the strings. What a concept! We’re still in our infancy compared to a piano or a violin, a pedal steel guitar is a brand new instrument. SGR: I can remember John Hughey telling me when he was a kid, he was obsessed with the sound he heard over the radio that turned out to be the ting-a-ling of Little Roy Wiggins. Joe: Little Roy had that signature lick, which is alternating fingers on two strings and get that real fast trill going. He used it on Eddy Arnold and a lot of great stuff back then. There were signature, which you don’t hear so much these days. Hank Thompson, Merle Haggard; signature licks. They all had these little dittys, and, of course, the little dittys came from the musicians. SGR: At this year’s Superjam, we inducted Lloyd Green into our Legends category. Talk about a signature lick, I think of Farewell Party. Joe: The way he built that was too cool. You can’t get over just how great that was. The thing about Lloyd was that stuff was so spontaneous, it just came off his fingers like butter. SGR: Jackson, Michigan. Is that where it all started? Joe: That’s where it all started. I took my first lesson in Jackson where I learned to play and am moving back to Tennessee. I’ve been taking care of Mom, as you know. She had a little illness, and that’s coming to an end. Packing it up and bringing it back to Nashville. SGR: Nice to see somebody’s hair a little longer than mine. Joe: I like my long hair. You know Gib, I wear long hair because I want nobody to mistake me for a steel guitar player. SGR: That’s too good! Joe Wright, thanks for your time.